I tried this last night at a party and was frankly disgusted. I couldn’t believe such a sickening sweet product was being sold as a premier option. I can’t imagine anyone who likes their whiskey less sweet than Jack Daniels enjoying this. 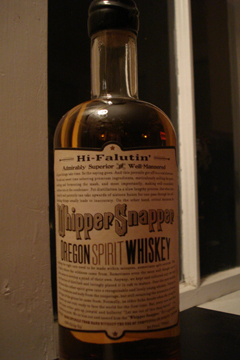 I love Oregon distilleries, but this is a miss. I agree with the previous reviewer, but will go further — this is the worst American whisk(e)y I’ve ever tasted by far. It’s the worst in the category of pretend-to-be-small-batch premium-priced pretenders. This is an exceptionally bad product. I can’t find a single redeeming quality — except that there are no free refills. — Nose: Corn and ashtray. — Taste: Corn, small-b(o)tched distillation process, backwash from your frenemy’s plastic tobacco-spit cup. — Finish: Has ruined my palette for the evening. I appreciate the Hooch’s thoughtful review — different strokes — and agree with the part on “presentation.” The self-conscious label had tons of idiot-appeal and should have been warning enough for me. If you want a sweet-bad corn whiskey, this is a lock. Especially if you have an uncle (or a horse) who’ll drink anything. Otherwise, choose from the bottom of the shelf and sight unseen — you won’t be more disappointed. The worst American booze money can buy. Bravo! The last few comments are Excellent examples in duche baggery. It is an ok whiskey but def not worth dumping out. I’ll actually have to add – that I love challenging myself to any and all whiskies – and saw this bottle up on the backbar and thought I’d give it a go. And the reason I’ve ended up here is because I was trying to track down some info on it as one of the worst whiskies I’ve ever had. And for those who chimed in with a not so positive review of it – I”ll second that – and don’t worry – your founded opinion has nothing to do with “douchebaggery”.